The market is brimming with hair clippers and beard trimmers – so many choices can overwhelm you. But is there a reliable product that can deal with both your hair and your beard, so you don’t have to buy two gadgets? This question bugged me too, so I did a little research and finally came up with a winner. Not only a powerful device but also an affordable buy. Meet Panasonic ER224S. How Well Does It Cut? Panasonic ER224S is really a neat and precise little piece of machinery. 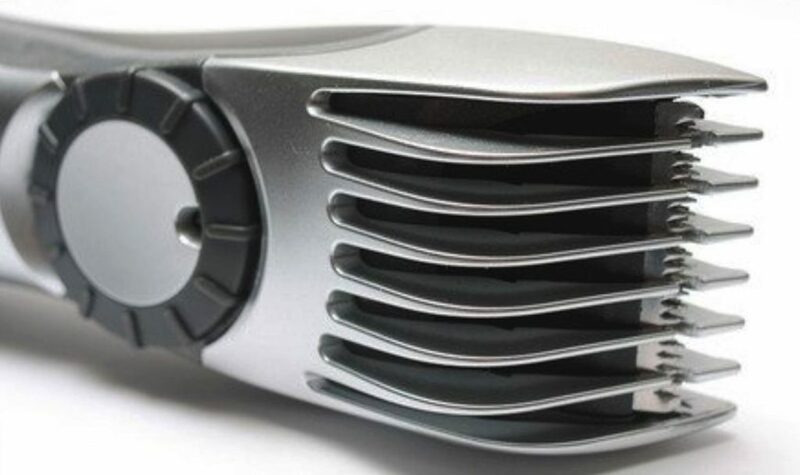 It’s a men’s gadget that can effectively cut your hair and also trim and shave your beard. It’s cordless, so it provides unlimited freedom of movement. On top of that, it’s one of the most competitively priced products out there. 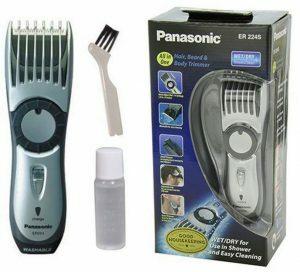 Panasonic ER224S is mainly aimed at those who want a versatile device for cutting their hair, trimming their beard and mustache, and even shaving. On top of this, it is a well-made gadget that will stand the test of time through continuous use. There are quite a few products like this out there on the market, but not many of them give so much bang for your buck. So if you’re looking for a nice piece of kit that won’t break anytime soon, look no further. Before we take a better look at its features, let’s start off this Panasonic ER224S review by unboxing the thing. It sure isn’t anything to write home about, but still, along with the trimmer, you’ll find an AC charger with the docking stand, a cleaning brush to conveniently clean it after use, and some oil for the maintenance of the blades. 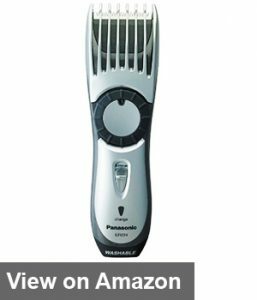 The first thing you notice is that Panasonic ER224S looks quite bulky for a beard trimmer. Still, you’re going to use it not just for your beard but also for cutting your hair, so that’s quite justified. The good thing is that you won’t have to make as many passes to get an area of your head trimmed. On the other hand, such a bulky appearance may cause some difficulties if you need to reach some tricky areas under your nose or behind your ears. Still, it beats fiddling around with a pair of scissors. And saves you plenty of time, too. All in all, it’s a sleek and ergonomically designed product which sits neatly in your hand. Of course, the main purpose of this Panasonic ER224S review is to determine whether this device gets the job done well. It is equipped with hypoallergenic precision cut steel blades which make for a safe operation without any risks of allergic reactions or skin irritation. If you to shave your face and have a real close stubble look, just remove the guard comb and let the blades do their work. The trimmer has 14 different length settings, varying from .04 to .79 inches, which means you can be very precise with trimming your hair or beard. Mind you, be very careful with the adjustable comb. It’s very brittle and can break easily during removal. A nice little feature is that if you push the guard down during trimming, the device will shut itself off so you don’t get cut. I found no issues with the trimming and cutting performance of the Panasonic ER224S. 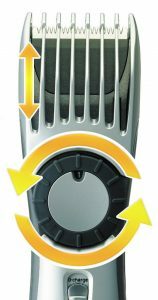 It’s not the fastest nor the most precise multipurpose hair trimmer, but it works well. 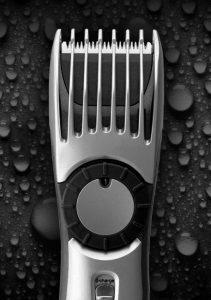 You just can’t expect the shaving performance to be on par with what more expensive electric shavers offer. What’s more, this device remains fairly quiet even when used intensively. Panasonic ER224S is fully waterproof. This means that you can use it under the shower. Once you’re done shaving, trimming, or clipping your hair, you can simply rinse it under running water and let it dry a bit and then and it’s good to go. Panasonic ER224S comes with a docking station that makes it look cool even when it’s being charged. The Nickel Cadmium battery features a very neat quick charge feature. It can be charged in just 5 minutes, for short emergency situations. But it takes eight hours to fully charge the battery. The good news is that once the charging is done, the battery can keep it running for 40 minutes. Since it’s fully waterproof, Panasonic ER224S just needs to be rinsed under running water. Additionally, you can always use the cleaning brush included in the package, so that you get rid of all the clogged hairs and debris. Included in the kit is oil as well, which needs to be applied to the blades after each shave as they are not self-sharpening. If you’re used to self-sharpening blades going back to manual lubrication may seem a bit of a nag. But it’s important that you do it because otherwise the blades will get damaged more easily. For just a few extra bucks, you might want to consider another great Panasonic product, the ER-GB40-S. It features a more modern design, as well as a few extra features. There are 19 different trimming length settings, while the rubberized areas provide an even better grip, especially when shaving in wet conditions. Just like its ER224S counterpart, the ER-GB40-S doesn’t come with a travel bag, so either way, you’re probably going to have to get one. When all is said and done, Panasonic ER224S is a good product. It could be a good buy if you need a neat and compact multipurpose trimmer that does get the job done. It performs well as a shaver too, and it’s fully waterproof so it can be used under the shower. If it tickles your fancy, you can buy it.